The 15 cm. horizontal Stainless Spot-on Sundial is suitable for the small gardens, conservatories, balconnies and windowsills. It makes an eye-catching feature in its chosen space, and its robust construction in 10 mm. stainless steel ensures that it will stay as good as new for many years. For customers in countries other than the UK, please contact the designer Piers Nicholson to place an order. 15 cm. 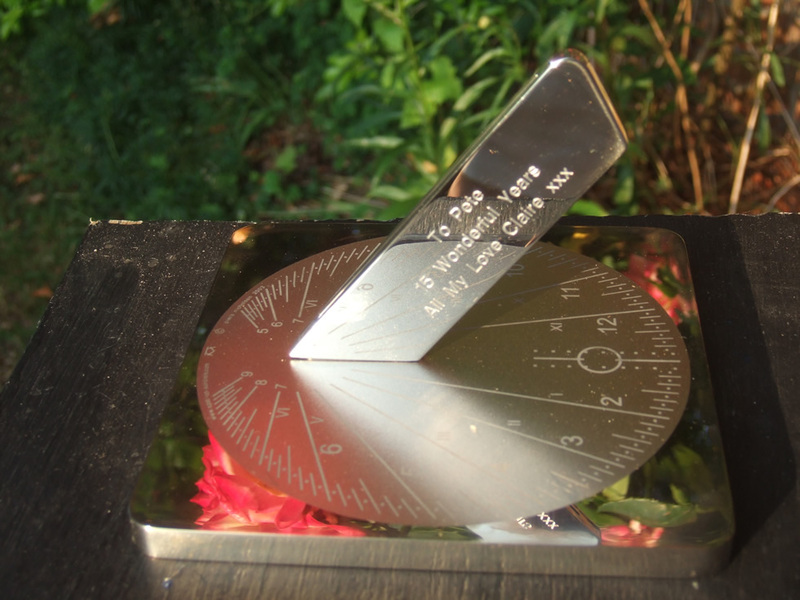 sundials are designed for the latitude of London (51.5 deg. N) but will work perfectly satisfacotily for a few degrees either side of that lititude. Delivery is normally from stock. Engraving can be arranged on the side of the gnomon, and costs £60 extra. The price of the sundial is £150 (approx 185 Euros, $200 US dollars exchange rates current in July 2016). UK courier delivery is £10; rates for other destinations can be supplied on request. Payment can be made by Intenet transfer or by debit or credit cars through Paypal.